We help hundreds of people each week organise hotels in Malaga, luxury hotels in Marbella, Apartments in Marbella, in fact we can help you organise your whole holiday in the Costa Del Sol, right from car hire from Malaga Airport, to the first and last rounds of golf you want to play. With everything in between. We have a team of dedicated people ready to make your holiday the easiest you’ve ever organised. Welcome to Spain! The phone number +34 678 688 666 is a Spanish mobile telephone number and can be used to contact us at all times. 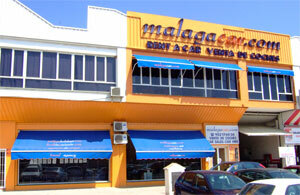 This number will be answered by our car hire partner malagacar.com.